Dan Kneen on the DTR BMW Superstock machine at Kirkistown. Manx rider Dan Kneen rounded off an excellent Easter schedule at the Irish short circuit races at Kirkistown in Co Down. Kneen set the ball rolling on Saturday with a race win and a runner-up finish on his DTR BMW Superstock machine at Bishopscourt, where he won the Enkalon Trophy for the very first time. The 29-year-old was back in action again at the Belfast and District Club’s traditional Easter Monday meeting on the Ards Peninsula and Kneen delivered the goods once more on his S1000RR, which is the same machine he will ride this season at the international road races. The Manxman, who missed the North West 200 and Isle of Man TT last season through injury, was a comfortable winner in the Superbike class as he opened his account in the first race from Charles Stuart on his Yamaha R1, with Mark Glasgow completing the rostrum places. Kneen also prevailed to win the feature Mayor’s Trophy, which he received from Alderman Deborah Girvan, Mayor of Ards and North Down Borough Council. Once again he beat Stuart and Glasgow to wrap up a double by four seconds and it was just rewards for the unassuming Isle of Man rider, who twice finished as the runner-up at the corresponding meeting in 2016 behind Ryan Rainey on the IFS Yamaha, who has since retired from racing. The 2014 Irish Superbike road racing champion is now preparing to test the Penz13.com BMW Superbike he will race at the North West, TT and Ulster Grand Prix in 2017 this weekend. Kneen, who rode for Northern Ireland team Mar-Train Racing last season, said he would have raced at the Around-A-Pound Tandragee 100 if the first Irish National roads meeting of 2017 had not clashed with the three-day test at the Autodrom Most circuit in the Czech Republic. “I’d love to have been at Tandragee but I’ve got a three-day test with the Penz guys to ride the BMW Superbike,” Kneen told the News Letter. “It’ll be the first time I’ve rode the bike and it’ll be interesting to see how it compares to the Superstock bike. Kneen, who won the feature race last year at Tandragee, is still on the lookout for a Supersport machine for the season ahead. 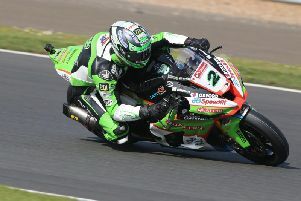 Kneen was left without a ride when Mar-Train Racing made the shock announcement in December that the team was calling time on its involvement in the sport. Meanwhile, Korie McGreevy won both Supersport races at Kirkistown. In the opener, McGreevy had the edge over Irish champion Jason Lynn, with Aaron Armstrong taking third. In another close second race, McGreevy made it a double with a hard-fought win over Lynn, with Ross Patterson coming through for third.